Adele Rolls In The Deep On Her 28th Birthday! 7 Amazing Dining Places In Alexandria! Farah Charaf: Arab Media Chooses Beauty Over Talent! 3 Reasons Why You Should Start All Over Again! Can Harmony Replace Real Women? 8 Reasons Why Stress Sends Us To The Cookie Jar! Soso The Duckling Now In IKEA..!! Latest F/W 16 Perfumes For A Passionate Winter! Luxurious Valentine’s Day Gifts For You And For Him! Sherwal Is Now At Cairo Festival City!! Oprah's Best Fashion Moments: She's Got The Look! Makeup Tips You Don't Want To Miss This Valentine!! Whether it’s in movies, TV shows, or real life, women have been rocking the platform now more than ever. 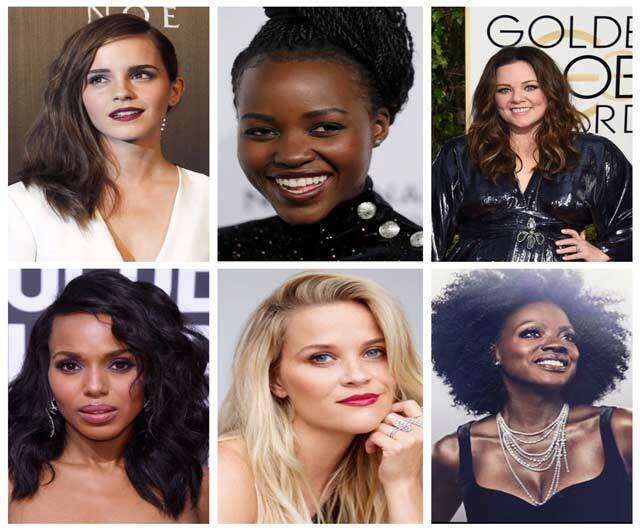 With each of them doing her own thing her own way, here’s a little something about 6 of the most inspirational Hollywood actresses at the moment. Despite experiencing a rough childhood living in desperate financial conditions, the actress and producer was able to overcome that and become the only black actor to win the Triple Crown: an Oscar, an Emmy, and a Tony. Davis has also greatly supported black people’s rights filming a documentary that seeks to highlight police brutality against black victims. With a great sense of humor, McCarthy found her way to Hollywood’s list of top paid actresses, marking second in 2016. But it’s not just the sense of humor that makes her remarkable, McCarthy has also shown support for over-sized women objecting to most designers’ disregard of them. In 2015, McCarthy launched her own fashion line which provides clothes for women of various sizes as a way to make girls comfortable in their own skin no matter how they look. As strong as the character she plays in the TV show, Scandal, Washington made a name for herself in Hollywood. However, it’s her support of human rights and women rights that makes the actress so inspirational. The star is an active member of V-Day, a movement against violence against women, and the Creative Coalition, which addresses social and industry-related matters. Witherspoon was able to prove her talent in Hollywood by picking a variety of outstanding roles receiving an Oscar, a Golden Globe, and an Emmy. In an attempt to empower women, she established her own production company aiming to make more movies with strong leading female characters as a way to portray real women and also inspire them such as Gone Girl and Big Little Lies, the hit series. After her debut role as Hermione Granger in the Harry Potter series, Watson has continued to surprise us with her unique talent and roles becoming a true role model not only for females but also for males. In 2016, the star created a Goodreads feminist book club called Our Shared Shelf which encourages people to read, gives them the opportunity to discuss what they read, and allows them to discuss feminist matters. After her breakthrough role in 12 Years a Slave which earned her an Oscar, Nyong’o showed no signs of slowing down taking on various exceptional roles. However, aside from acting, Nyong’o is also a writer and her first book in support for young black girls, Sulwe, is supposed to be published in 2018. It narrates the story of a five-year old Kenyan girl and her discomfort with having the darkest complexion in her family; a matter Nyong’o was insecure about as a child. Subscribe to our mailing list to receive an update when new items arrive! Copyright © FREESIALIVE. All rights reserved.